Table magic using a banana, a bandana and a pack of cards has seen 15-year-old Giles Beaumont become the Next Big Thing 2018. The Young Magician of Mann honorary member was competing against 13 other acts at the Gaiety Theatre on Saturday February 3 in the grand finale of talent competition for 10 to 18-year-olds organised by Manx charity Junior Achievement, winning first prize of £500 sponsored by the Isle of Man Steam Packet Company. Runners-up were break dance duo The J Breakerz, 13-year-old Jackson Katz and 10-year-old Junior Fernando who took away £250 sponsored by Manx Professional and Educational Services. Third place went to Molly and Alicia – dancers Molly Bowman, 15 and Alicia Schofield, 14. 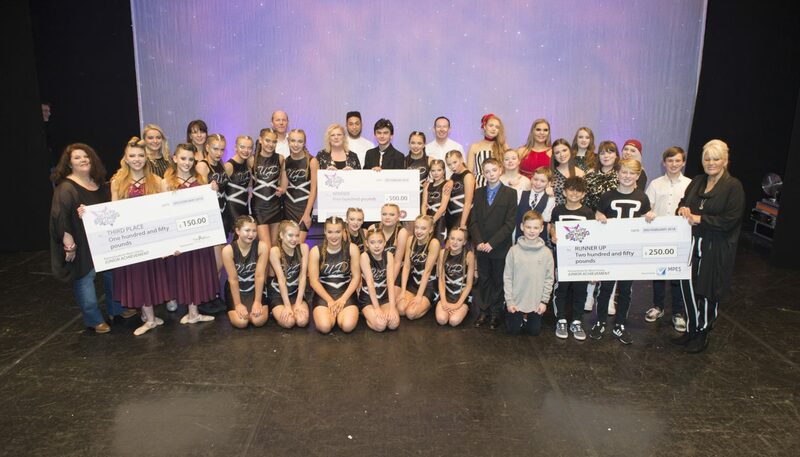 The firm friends choreographed their own routine for the show, which won them £150 sponsored by the Platform Theatre School. Now in its seventh year, the show was sponsored by Paragon Recruitment, Swagelock and Energy FM and opened with a performance on the electric violin by winner of the Next Big Thing 2016, Tabitha Templer. Judges were Dean Helm of Paragon Recruitment, David Hester of Swagelock and Young Actor of Mann Alexandra Slater. Joining them on the judging panel were ballroom dance teacher Mary O’Dea and Lloyds Banking Group diversity champion Luke Adebiyi. Junior Achievement chief executive Sue Cook explained: ‘For this year’s final we decided to open up the judging panel so we put a post on our Facebook page inviting would-be Sharon Osbournes and Simon Cowells to apply and the response was overwhelming. We’re delighted that Mary and Luke agreed to be involved; their input really added to the dynamic of the judging process. ‘Once again, this year’s Next Big Thing revealed some truly amazing young talent. All 14 acts performed magnificently and the audience were with them every step of the way. Coming out onto the stage of the Gaiety Theatre can be daunting – especially if it’s an artist’s first time – but they all clearly enjoyed every minute of the experience, as did all of us in the audience. Applications for The Next Big Thing 2019 open in August 2018. To find out more follow thenextbigthingisleofman on Facebook or visit thenextbigthing.im.